Uri Ehrlich addresses a relatively neglected but central component of the act of prayer: its nonverbal aspects, represented by such features as the worshiper's gestures, attire and shoes, and vocal expression. In the first part of this book, the author engages in a two-tiered examination of nine nonverbal elements integral to the rabbinic Amidah prayer: a detailed historical-geographical consideration of their development, followed by an analysis of each gesture's signification, the crux of this study. Of all the possible models, it was the realm of interpersonal communication which had the strongest impact on this consideration of the rabbinic Amidah gesture system. 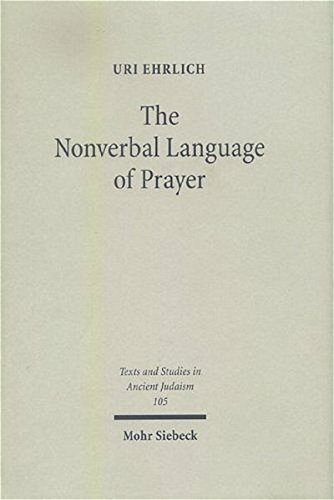 The concluding chapters explore the broader rabbinic conception of prayer embodied in these nonverbal modes of expression. Unlike mainstream prayer studies, which concentrate on the textual and spoken facets of prayer, the holistic approach taken here views prayer as a complex of verbal, physical, spiritual and other attributes. If you have any questions about this product by Brand: Paul Mohr Verlag, contact us by completing and submitting the form below. If you are looking for a specif part number, please include it with your message.